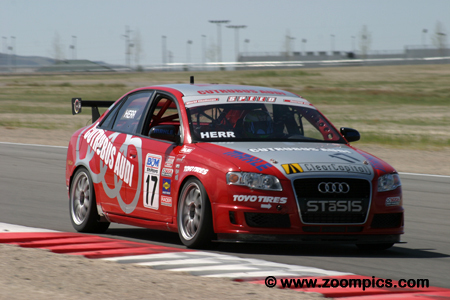 In 2007, the Sports Car Club of America’s (SCCA) World Challenge series was in its 18th-season. 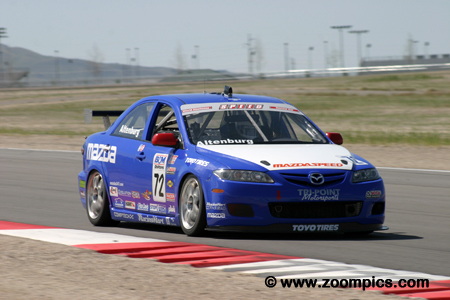 With SPEED TV as the primary sponsor, SCCA had developed a successful format that attracted competitors and fans. GT – The GT class rules accommodated a large range of vehicles from different manufacturers. Engine displacements ranged for the 2.5-litre turbocharged Volvo S60-R to the Dodge Viper with an 8.3-liter V10 motor. While most of the cars were rear wheel drive the series also permitted all-wheel-drive vehicles such as the Nissan Skyline GT-R, Porsche 911 AWD TT, Subaru WRX STI and Volvo S60R. A majority of the competitors raced the Chevrolet Corvette, Porsche 911 GT3 Cup or Dodge Viper. Touring Car – The Touring Cars were limited to an engine displacement of 2.8-liters. Vehicles originally equipped with turbocharged or supercharged motors were also homologated for the series. The class was split predominantly between front wheel drive cars from Acura, Honda, and Mazda and the rear wheel drives such as the BMW 325. Also proving very competitive was the all-wheel-drive Audi A4. There were eleven-race weekends during the 2007 season – ten-races for the two classes. The Touring cars did not compete at Long Beach or a new venue at Lowes Motor Speedway. Touring Cars raced twice at Watkins Glen which was a new track on the 2007 schedule. Also, the Touring Cars were the only World Challenge class competing at Lime Rock. As in 2006, the opening round was in March at Sebring, Florida and ended in late October at Laguna Seca, California. Jeff Altenburg started on the pole in the No. 72 Mazdaspeed Motorsports Development Mazda 6. On the first lap, he is followed closely by twenty-four competitors. 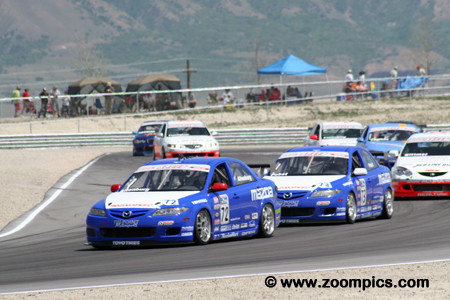 During the fifty-minute race the Touring Cars would complete 13-laps around Miller Motorsports Park’s twenty-five turn 4.5-mile long road course. At the start, Altenburg jumped into the lead followed closely by his teammate Randy Pobst. On lap-6, his car shut-off which allowed Pobst to pass and Acura drivers – Kuno Wittmer and Pierre Kleinubing to close the gap. The car corrected itself and Altenburg found himself battling with Pobst. On the last lap the two ran side-by-side for three corners before Altenburg made a pass for the win. 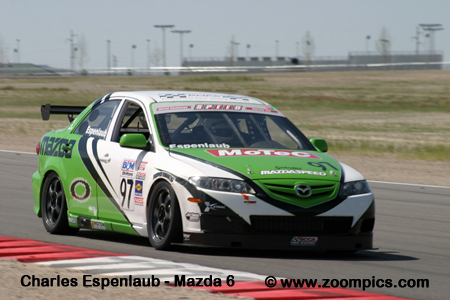 Qualifying second in another Mazdaspeed Motorsports Development Mazda 6 was Randy Pobst. When his teammate, Jeff Altenburg, suffered a mechanical issue it appeared that Pobst would score his first win of the season. He led laps six through twelve - but Altenburg’s issue was temporary. Altenburg passed Pobst on the last lap leaving him just 0.295-seconds behind at the checkered flag. 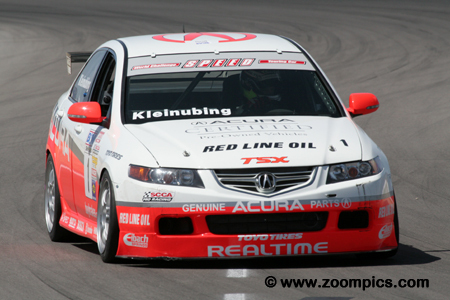 Pierre Kleinubing, started fourth in the RealTime Acura TSX. At the start, Kleinubing was passed by his teammate Kuno Wittmer but he eventually got by him and third fastest qualifier Seth Thomas. 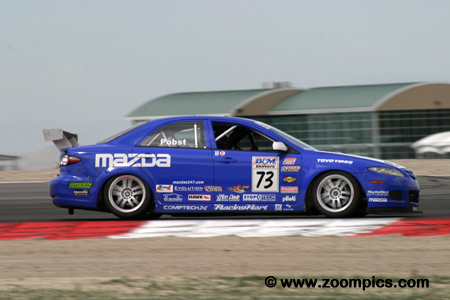 When Altenburg’s car shut-off he and Wittmer closed on the leading Mazdas. The battle between Pobst and Altenburg put Kleinubing in a position to capitalize on any errors. But there were none and he finished third. Canadian, Kuno Wittmer joined the RealTime team in 2007. A switch from the previous season’s Mercedes-Benz allowed Wittmer to showcase his talent in the more reliable and quicker Acura. At Miller Motorsports Park, he qualified fifth and ran as high as third before finishing fourth behind his teammate Pierre Kleinubing. To date, this was his best World Challenge result. 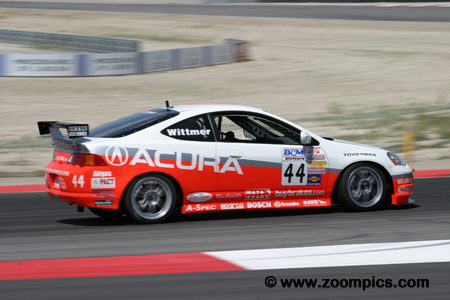 Local resident, Byron Smith qualified an impressive eighth which put him in the company of the better financed Acura and Audi teams. Unfortunately, the driver of the No. 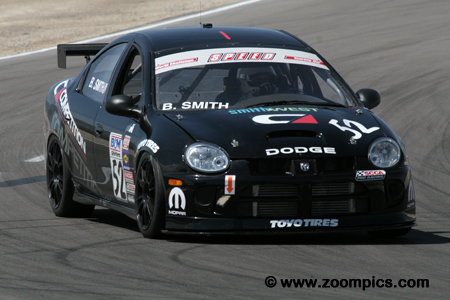 52 Dodge SRT-4 retired after just four-laps with mechanical issues. 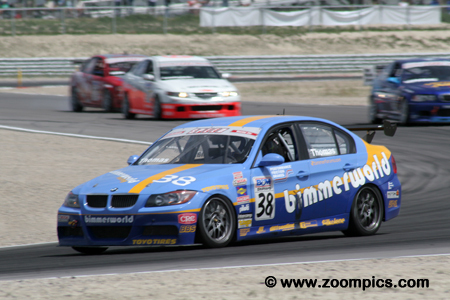 BimmerWorld opened the 2007 season with improved performances. Seth Thomas qualified the No. 38 BMW 325i fourth at the season opener in Sebring and third at Miller Motorsports Park. At Miller, Thomas diced with the two quickest RealTime Acuras of Pierre Kleinubing and Kuno Wittmer. He would have to settle for a fifth place at the checkered flag. 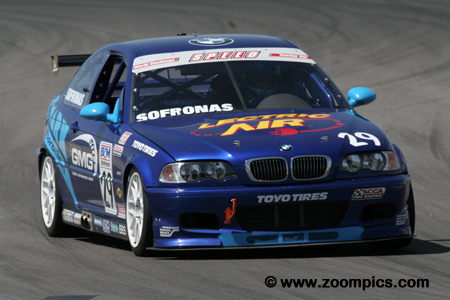 World Challenge veteran, James Sofronas, qualified the Global Motorsports Group BMW 325Ci eleventh. He finished sixth which earned him the Toyo Cup Award. This award recognizes the highest placed competitor not making their living driving race cars. His brother, Brad Sofronas, won the B&M Holeshot Award after advancing seven positions on the first lap. Chip Herr opened the season with a fourth at Sebring. The driver of the No. 17 STaTIS Audi A4 looked set to produce similar results after qualifying seventh. Unfortunately, he finished eighteenth – a lap down to the leaders.